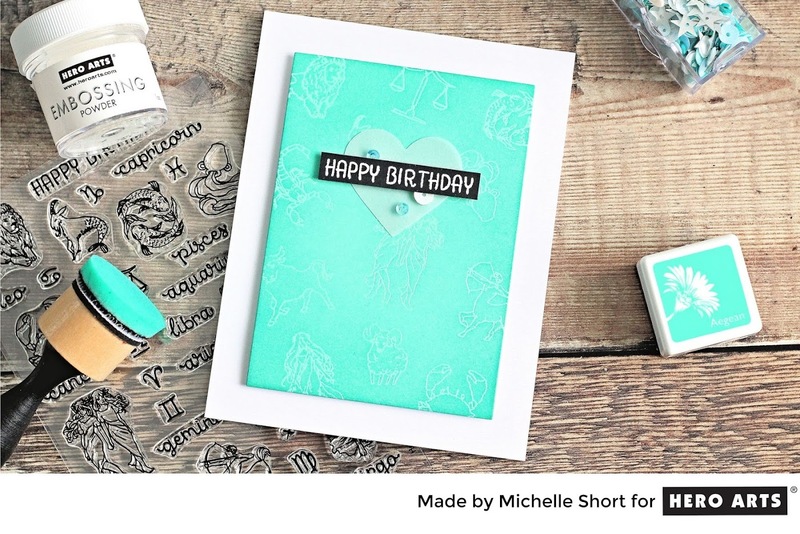 Hello there, today I am over on the Hero Arts Blog sharing a card made with the Zodiac Birthday stamp set that was released as an add-on for this month's My Monthly Hero kit. Since I wasn't making the card for anyone in particular, I decided to use all of the star signs on my card but if you knew the person you were making it for, you could use just their sign, or use them all like I have done and make a focal point of their sign. The star sign images are little difficult to see in the photos but they definitely show up nicely in person. They also show up a little better in the video too. You can see that directly on You Tube HERE. For more information on how I made the card, please head over to the Hero Arts Blog. Thanks so much for popping by today. I hope you have a great week! Great idea for a background and I love the colour.